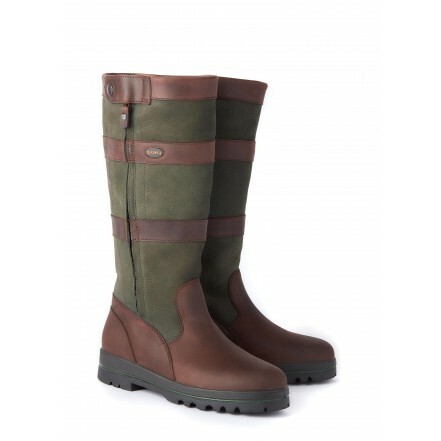 The Dubarry Wexford waterproof leather country boot provides maximum performance for all your country pursuits. Packed with practical design features such as the side zip to enable easy slide on and off and the GORE-TEX lining - waterproof yet breathable, these comfortable country boots for women are the perfect waterproof walking boot. For the complete country and outdoor look, just add a Dubarry waterproof jacket. • GORE-TEX® lined, waterproof and breathable. • Full, heavy duty zip with bellows for ease of entry. • Button fastener to hold zip secure. • ExtraFit„ for foot entry and foot forepart. • Direct inject moulded bi-compound, bi-colour outsole. • Subtle, signature Dubarry and GORE-TEX® branding.